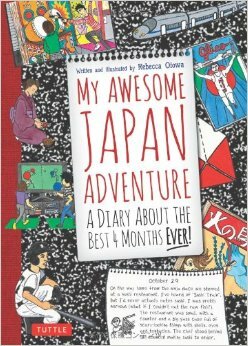 If you have teens or tweens who are curious about Japan, I suggest attempting to snag a copy of My Awesome Japan Adventure by Rebecca Otowa. There are admittedly tons of books ABOUT Japan out there and more than a few fictional young adult stories set in Japan, but this title is more of an autobiographical adventure than anything else. The story follows Dan, a 5th grader who heads to Japan on a four-month exchange with a Japanese family. Lucky for Dan, his hosts in rural Japan speak English (the only somewhat unbelieveable part of the story 😉 ) and they shepherd him through an experience that spans attending school, harvesting rice, visiting a ninja village, learning calligraphy and pounding mochi at the New Year. Dan documents it all in diary-style, with entries for various topics, and the layout feels very much like a comic book in a sense. There’s a lot covered here but it’s all presented at a level that’s rather accessible for both those with no knowledge of Japan and for a younger audience that doesn’t want to (or can’t) pour through dry guidebooks. Dan writes a lot of words on each page but they are accompanied by multiple illustrations. For example, his entry on a typical Japanese breakfast shows each dish in full color, and he details his walk to school with various intriguing panels. I especially liked his pages on micro-sushi (a fad I had never even heard of) and karuto, a traditional game that I had heard about but was a bit fuzzy on the rules. Also interspersed throughout the book are “lessons” from his host brother and sister. They introduce topics such as origami (with step-by-step detailed pictorial instructions) and how to make rice balls (again with hand-drawn directions). Dan covers a lot in four months but ends with a list of things he wants to come back and see … leaving the reader hoping that the author will indeed find a way to include a sequel sometime in the coming years. There’s no question this is a cool edition to anyone’s bookshelf, be they young or old. Rebecca Otowa truly knows her subject – having lived in Japan for 30 years and raised children and grandchildren here, she has a good feel for what will interest her younger readers. Yet adults will also find a host of information contained within the pages and may enjoy such insights into things like school routines and family holiday traditions that are not often elaborated upon in more traditional guides. It’s also slim enough to slip into a carry-on for Japan-bound travellers and may even inspire young adventurers to chronicle their own experience in a similar journal.